The candidate can design, develop, test, and deploy programmatic solutions that are maintainable and re-usable and follow design patterns and object-oriented programming best practices. 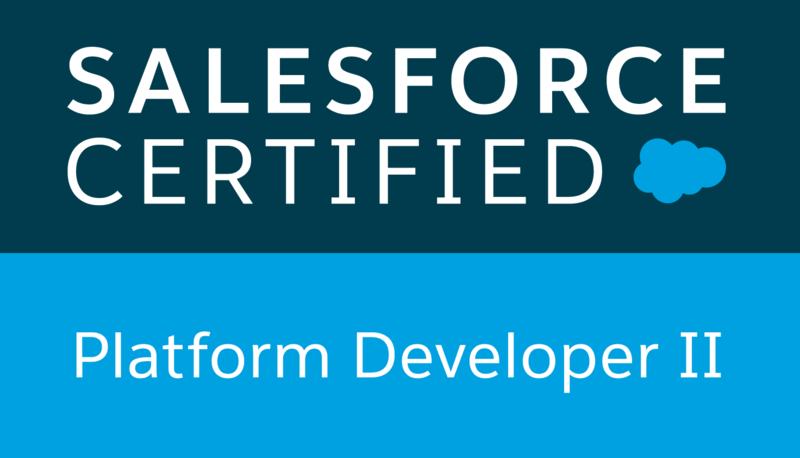 The Salesforce Platform Developer I credential is a prerequisite for the program. Effective June 28, 2017, the Salesforce Certified Platform Developer II (PDII) certification will consist of two parts: a proctored multiple-choice exam and four Trailhead Superbadges which replace the Programming Assignment. Similar to the Programming Assignment, superbadges show that you can apply what you've learned to advanced, real-world business requirements covering features, concepts, and scenarios that are essential for a Platform Developer II to know, including Apex programming, data integration and more. Given a scenario, debug unexpected behavior due to save execution order. Describe the options, best practices, and use cases for asynchronous execution. Describe the techniques for using Visualforce to perform actions and partial page refresh. Describe techniques to maximize code re-use with Visualforce. Given a scenario, identify the appropriate deployment tool.